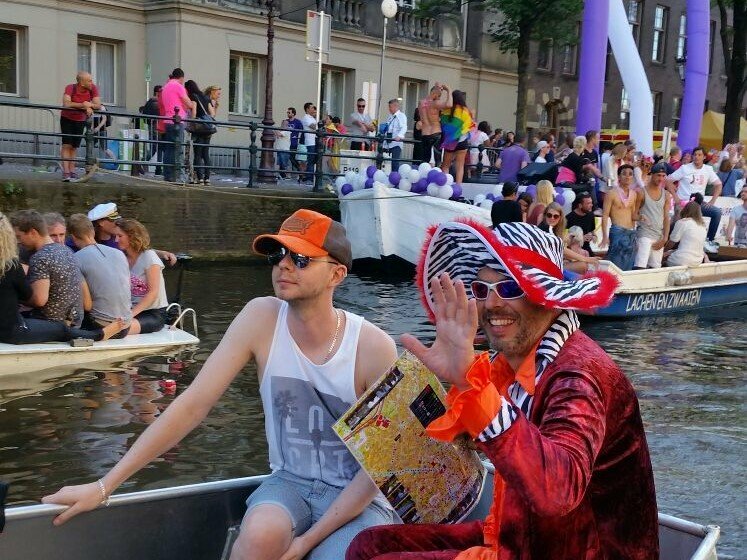 Gay Pride 2019 - Rent Boat & Celebrate Gay Pride on the Canals! HIRE A BOAT FOR THE GAY PRIDE CANAL PARADE! For the best views and the most intense experience you can hire a boat on the day of the Gay Pride Canal Parade. Just find a good spot on the route and enjoy the privilege of having front row seats on your own rental boat. Before and after the parade you can make a nice tour with your boat on the Amsterdam canals and the Amstel river. HOW DOES A GAY PRIDE BOAT HIRE WORK? For the Gay Pride you can only hire a boat for the full day. Pick-up is from 9.00 to 11.00 hrs. and we expect your return between 17.00 and 20.00 hrs. There is a maximum of six people per boat, due to license and insurance. HOW TO BOOK YOUR BOAT FOR THE GAY PRIDE? The rate for this full day Gay Pride boat rental is € 250,-. This is all-in and the best rate you will find in Amsterdam. For booking your Gay Pride boat rental please use our easy online booking tool and choose the full day option for the first Saturday in August. Looking forward to welcoming you! The spectacular highlight of the annual Gay Pride is the Canal Parade, every first Saturday in August. 100.000’s of spectators gather along the Amsterdam canals to party and to admire the 80 impressive theme boats full of people celebrating freedom and diversity. HOW DOES A GAY PRIDE BOAT RENTAL WORK? For the best views and the most intense experience you can rent your own boat on the day of the Gay Pride. Just find a good spot on the route and enjoy the privilege of having front row seats. Before and after the parade you can make your own boat tour on the Amsterdam canals and the Amstel river. For the Gay Pride you can only rent a boat for the full day. Pick-up is between 9-11 AM and we expect your return between 5-8 PM. There is a maximum of six people per boat, due to license and insurance. HOW TO RENT YOUR BOAT FOR THE GAY PRIDE? The rate for a full day Gay Pride boat rental is € 250,-. This is all-in and the best you will find in Amsterdam. For bookings please use our easy online tool and choose the full day option for the first Saturday in August. Looking forward to welcoming you!